And so begins the process of meeting me during your FREE Wedding Photography Consultation. While I am available to meet with any couple to discuss their needs, it is always best to schedule an appointment only after a contract has been signed with the venue. This will help ensure my availability on your wedding date. 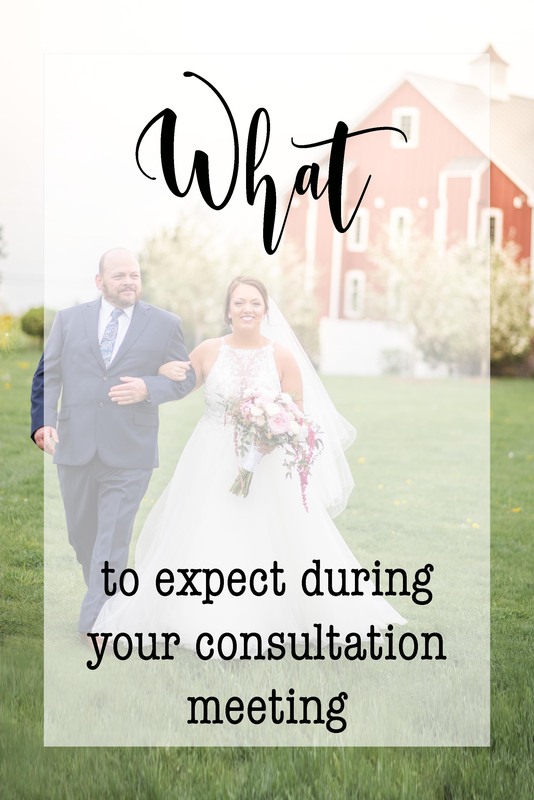 We plan a consultation date and time that is mutually convenient to the couple and myself and anyone else in the “decision making” process. This is important so that everyone hears the same information, has an opportunity to ask and hear the same answers to any questions. If your mom, or dad, or grandmother, etc, is part of selecting which and how much to spend on a wedding photographer (pick me! Hehe), then its important to have those people join us. For the consultation, please plan on about 1.5 hours (or a bit more if you elect to sign a contract that day). I work really hard at accommodating my clients and (since I am a full time photographer) am willing to meet just about anywhere on weekdays, weeknights, or weekends, so long as my schedule permits. I can meet you near your work, home, or somewhere in the middle, so long as we have a quiet space with an area to spread things out. I start by giving you a personalized packet with tentative information about you, your wedding, my photography, work-flow, planning guide, and several other collateral materials including packages and prices. I’ll encourage you to stop and ask me questions at any time during our meeting. I want the best for you! If I don’t already know, I’ll ask you about your story – how you met, where you met, how long you’ve date, how and when you got engaged – all in the interest of learning more about your story, your personality, etc. in order to begin creating mental pictures of capturing your wedding with your personality in mind. Before I launch into the formal part of my presentation, I ask a question that most photographers simply don’t ask: What are YOUR EXPECTATIONS?! Really, what do you want from a wedding photographer? What kind of photos or effect or feel or style do you prefer? Candid? Photojournalistic? Staged? Posey/Formal? Light and airy or deep saturated and sharp photos? Creative and artsy? Few black and white? Or something else? I’ll show you a collection of 20X16 images that are not only stunning images in their own right, but also take the time to explain to you what technical means I used to take each photo, what I was aiming to achieve, seek your feedback on what you see and like (or not) as a way or discovering your “taste”. Each photo I will show you has a story and is specifically selected by me in order to tell you something about my style: Ability to direct people, how I select locations for shoots, which lenses and when I use them, what aperture and shutter speeds I use to create certain effects, etc. Unless you are already versed in fundamental photography skills, I want to help educate you a little so you know what you’re getting for your investment! I’ll keep saying this: I’m not just a guy with a camera who presses the shutter in hopes of capturing photos. My technique is methodical, well planned and rigorous. I want to leave nothing to chance. I will review my work flow. Here again, most photographers either don’t have a work flow, or for those that do it is not a very intelligent and mature work-flow, and for the few who have a mature work-flow – they elect to not share it with you and keep it a “secret”. For me, I’ve learned that when I want to purchase something, I want to know what I am getting and how well it is put together. My work flow, which I call “24-Point Peace of Mind Work Flow” should slam-dunk convince you I know what I am doing, how I do it, what steps I take to help ensure nothing is left to chance. You don’t want to miss hearing about my work-flow! Click Here for a Teaser of my Work Flow. We review packages and prices. I offer several “standard” and popular packages that are reasonably priced (I know my competition). I also am able to customize packages that specifically meet your needs and or budget. Check these Package Prices to get started – Click Here. If you’re ready to sign a contract for a specific or customized package, we can do that at our meeting. If however you wish to give it more thought, we can sign a contract using my electronic signature service I subscribe to. So you know, in order to guarantee my services for your specific wedding date, a contract must be signed and a 50% deposit made. Understandably, my services are provided on a first-come-first-serve basis. For other related and helpful answers to your questions, please check out my FAQs page Here. So now that you know, drop me a line to set up your consultation! When can we meet?